Today's Tutorial is about how to create rar/zip file cracker using python. 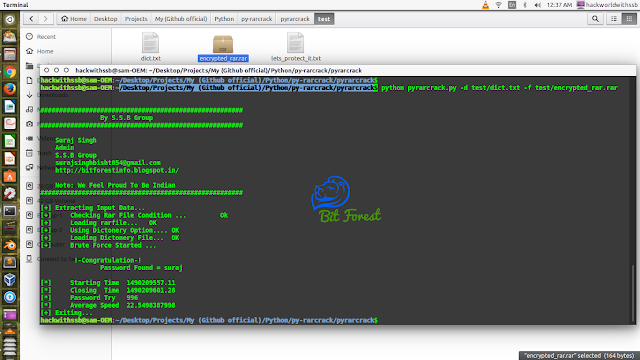 or you can say how to create python script for brute force rar/zip file using rarfile/zipfile python module. here, I am going to show you both examples one by one. 2. Rar File Cracker (keep reading). so, let's start with rar file cracker. for installing python rarfile module through pip. how to extract rar file in python using rarfile. here, I am showing a simple example. print "You Input Password is wrong"
print "[ Error ] Please Provide Rar File Path "
print "[ Error ] Bad Rar file"
here, this is my codes. but if you want latest updated example. then, check here my GitHub repository.